Click here to visit Poker.com. 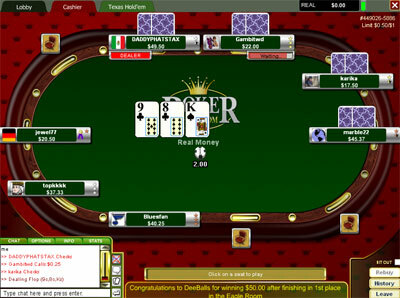 Poker.com is a very new online poker room that has been aggressively promoting to build its player base. I like the unique software available at this site, and their main promotion has been to offer freerolls of actual substance to players. Because of the initial attraction of freerolls, this site also attracts soft competition, and you�ll run into very large pots when you play at their ring games. Overall, I give this site good scores for weakness of competition, promotions, and instant cashouts. I hope to see them grow. The standard bonus from Poker.com is 30%, but if you use this link and enter bonus code �FIRST50�, you can get a 50% deposit bonus good up to $100. They seem to be trying to build up their network via bonuses and other freebies. This is a pretty good bonus, and mid-stakes players shouldn�t have trouble clearing the entire bonus. Smaller stakes players may be working for a while on this as you earn $1 of bonus for every 150 comp points, which are gained through tournament entries and ring game play. The main form of promotions at Poker.com is through their freerolls, which are run multiple times daily. If you want to get to know their software, you can play one of the $100 crapshoots every 3 hours. These are largely frustrating and shouldn�t be taken too seriously, but I like that they structure the blinds quickly enough to finish these events within a couple of hours. The better choices for freerolls are the weekly $20,000 event and the biweekly $4,000 event. You actually have to play throughout the week to get into these, meaning a smaller field and a larger chance of winning. The larger freerolls are actually very nice rewards for playing there regularly. Of course, they also offer the sign up bonus as another promotion, and they�re starting to offer more incentives to players who earn comp points. The ring games here are very loose with plenty of calling stations and inexperienced players, so you should have a pretty easy time at full ring games by playing a tight-aggressive game. Most of your opponents at Poker.com will play too many trash hands from any position, so be sure to raise your premium hands preflop. Flop percentages of 45-50% are normal at full ring games, and the pots are usually 50-60x the big blind at my favorite time of cash games � no limit. No limit ring games are usually busy up to the $1/2 or $2/4 level, and you can sometimes find a $5/10 game going on. Fixed limit games are popular up to about the $1/2 or $2/4 level. The tournaments at Poker.com are usually focused around their freerolls as they don�t have a huge amount of traffic yet. However, small stakes players will find 100-150 players at $3 or $5 buy-in events. Larger tournaments with $10-50 buy-ins attract anywhere from 25-100 players during peak hours. One positive about the lower tournament traffic is their satellite system, as you can win entries into larger supersatellites against very few opponents. I�ve heard snobby players criticize the Poker.com software for its simplicity, but I find it to be a lot of fun with some really neat features that add to the experience. I give them credit for coming up with an original software engine, and the graphics are pretty sharp. You can also enter animated smilies at the table, which will show up in its own comic-book bubble. Other unique features include winning percentages during all-in situations (think televised tournaments), rabbit-hunting for extra cards if you win the hand, and the ability to only show down one of your cards. You also earn little stars and ribbons next to your name for winning special tournaments. -Good deposit bonus. The clearing requirements aren't enormous, even for smaller stakes players. -The best freerolls online. They do offer the most, especially for regular players. -Soft tables. The competition is mostly from inexperienced new players. -Original software. They have some interesting quirks that are unique to the site. The cashouts are a big positive from Poker.com, since you can potentially get instant cashouts to NETeller. You should be aware that this only works up to the amount that you deposited. For winnings, you�ll have to wait the standard amount of time � usually about 24-48 hours. Currently, customer service is dealt with strictly via e-mail, but they seem to be one of the fastest in terms of response time � typically under 15 minutes. Big Slick can be a tricky hand against weak players at Poker.com who have the Ace-anything mentality. Many of your opponents will play any Ace regardless of the kicker from any position. Even if you raise preflop, you should realize that many online players will stay in anyway. You should certainly bet out with a flop like A-8-4, but you will occasionally be up against A-8 or A-4, who has you crippled at this point. Having A-K in this situation is a strong hand, but it�s still only one pair. Don�t be so willing to jump the gun and call an all-in raise from weak opponents.